Catherine Samba-Panza is the latest President of the Central African Republic; an improbable country on many levels. After Michel Djotodia’s removal from the presidency of the Central African Republic (CAR) on the 10th January, speculation and rumours about his successor were rife. Would it be Josué Binua, who had been a minister under Djotodia but was previously a confidant of the ousted Jean-Franí§ois Bozizé? No, it soon became clear — members of the newly-resigned government were excluded from consideration. This was fortunate. The choice of Binua, an evangelical preacher, at a time when religion has become politicized in new ways in the CAR, would not augur well for building trust after the past year’s violence. The strictness and extensiveness of the presidential criteria left some joking that they would exclude almost everyone. Almost, but not quite. On Sunday night, members of the National Assembly elected Catherine Samba-Panza, Mayor of Bangui and a businesswoman and lawyer. Diplomats and aid workers knew Samba-Panza as a founder of the Association des Femmes Juristes Centrafricains (AFJC), an organization they tripped over each other in a race to fund. Unlike many other civil society organizations, the AFJC had developed its own capacity to manage and develop projects, all supporting the rights of women. Whether Samba-Panza’s election will be a silver lining to these months of strife is still unknown. Someone with her background would never have been elected in other circumstances. Recent elections in CAR have been far from free and fair, and they accord a huge structural advantage to the incumbent, so relative outsiders like Samba-Panza find it hard to develop constituencies. 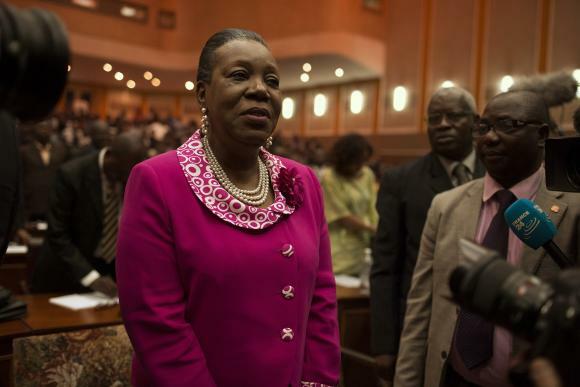 Samba-Panza is the first woman to lead the CAR, a country in which powerful women face particular challenges. To give just one example of the complicated, little-studied workings of gender and power in the CAR: the HIV rate among professional women is one in four, as compared to about one in sixteen in the population as a whole, or one in four among men in the security forces. Now that the issue of who will be president is settled, what next? Some of the main ways the CAR has made it into the media lately dangerously misrepresent the dynamics at work, as a glance at the country’s history makes clear. Instead, I can offer two small ideas that I think would help. Over the past few months, the CAR has been subject (as usual) to misdiagnosis by advocates of particular action, disguised as disinterested analysts. The present misdiagnosis comes in the form of warnings about the possibility of genocide. In November, French officials first invoked the pending genocide. As recently as last week, the head of the UN Office for the Coordination of Humanitarian Affairs (OCHA), Jean Ging, warned that all the elements were present for a genocide in the CAR. The French sought greater support for a UN peacekeeping mission. OCHA faces major shortfalls in its requests for humanitarian funding. “˜Genocide’ remains a word people pay attention to. Though, as Alex de Waal noted, it is subject to “˜boy who cried wolf’ dynamics. But genocide-mongering does nothing to help us understand the messy dynamics of conflict in the CAR today, particularities that analysts and policy-makers alike increasingly recognize as the crucial starting point for any attempt to help. The standard “˜genocide’ framework gets tricky to apply to CAR as soon as we try to figure out who is the victim and who is organizing that group’s destruction: the levels of violence are high all around. The violence in the CAR has frequently been described through reference to an imagined religious divide between Christians and Muslims — a perspective that obscures more than it clarifies. Religion has indeed become politicized in the CAR over the past decade (former president Bozizé led an “˜église de réveil’, as evangelical churches are known in the CAR). But like ethnicity in the 1980s and 90s, it confers not a whole identity but just one element of a cosmopolitan sense of self, various elements of which become useful for political alliance-building at various moments – the categories of “˜Christian’ and “˜Muslim’ are also incredibly diverse. When the Seleka alliance took power in March, much was made of Seleka fighters’ “˜Muslim’ origins – journalists asked me if Djotodia, the country’s first Muslim president, would impose Islamic law or foster Boko Haram-style extremism. However, in subsequent months, Seleka commanders recruited in Bangui and the surrounding mostly-Christian areas, and today fighters describing themselves as “˜Seleka’ are as likely to be found in a church as a mosque. During the violence and insecurity in Bangui at the end of 2013, the head imam and the bishop of the Catholic Church sought refuge in the same building. In short, the conflicts are certainly not as simple as religion-versus religion, and they are the products of a range of dynamics that are by turns highly local, as well as regional. History is important here: at the end of the nineteenth century, Central Africa was being incorporated into trans-Saharan (Muslim) networks through the establishment of raiding-and-trading outposts. The arrival of the French first caused a spike in the slave-raiding. The French found the raiding sultans useful as intermediaries – arming and equipping them. But eventually they assassinated the most powerful raiding sultan when they thought he would decamp for a new base where he would be harder to control. Trans-Saharan networks remained important, but after the first decade of the twentieth century, the active trade and warfare were replaced by stagnation, and French administrative energies stayed centralized in the capital. They leased most of the colony to concessionary companies. The area home to most Muslims, the Northeast, was declared an “˜autonomous district’ because it was too isolated and depopulated to keep up with the circulars issued in the capital. As a result, everything that is “˜state’ and “˜nation’ in the CAR grows out of the French-Christian enterprise centred on the capital. Central African administrators from the south and west who are sent to the northeast (the few who actually take up their posts, that is — most prefer to reside in Bangui or other better-appointed places) — such as the town of Ndele, where I did much of my research — consider it Central African territory occupied by foreigners. However, these “˜foreigners’ may have lived in the country for generations. In making these claims, the government officials echo their colonial predecessors, who justified killing the raiding sultans because they were “˜foreign’ invaders with no right to rule over people here. The foreignness of the French to this area went unremarked, of course…. Since this territory is occupied almost exclusively by “˜foreigners’, the central government does very little there. People in northeastern CAR feel neglected. People with Islamic-sounding names are made to pay more at the roadblocks that proliferate especially in the southern and western parts of the country than people with Christian names, and it is harder for people from the Northeast to obtain national identity documents. Many Muslims, like former president Michel Djotodia, take a Christian name in order to minimize the discrimination they face. Members of the rebel groups that emerged in northeastern CAR between 2006 and 2009 and eventually became part of Seleka took up arms not so much to replace the government as to force it to distribute more largess to them. Among their grievances: the largest town in northeastern-most Vakaga prefecture, Sikkikede, had not seen a government official in nearly a decade. People in the Northeast are in a bind: not Central African enough for the CAR, but not foreign enough to count as citizens of other countries, either. Another source of tension stems from the high levels of migration after upheaval in Chad and economic crisis in other neighbouring countries, such as Cameroon. Many of these migrants are Muslim, and many profit from commerce, whether running shops in markets or trading diamonds. Legally, immigrants’ children who are born on Central African soil are CAR citizens. In popular opinion, though, they remain foreigners. The migration has bolstered Central Africans’ widespread fear that the country is being invaded by foreigners, as it was once by trans-Saharan raiders and French concessionaires. The outsized roles of the Chadian president and men-in-arms in the CAR’s politics, especially over the past decade, also adds to people’s frustrations. Given all of these dynamics and histories of mistrust, what can be done? Even those of us who warned in 2011 and 2012 that violence was likely coming did not foresee the inter- and intra-community score-settling and cruelty that has emerged in the past few months. Since the change in power, diplomats in the region and in the international community have pushed for rapid presidential elections. This is a mistake. In the fighting, voter registries (both paper and electronic) have been destroyed. Re-establishing them will be a massive undertaking that risks exacerbating the tensions around nationality described above. It will consume scarce resources when necessary emergency humanitarian aid is underfunded. To satisfy the widespread desire for democracy (Bozizé’s electioneering made Central Africans very unhappy), it would be better to start with local elections, which have not been held in the CAR for decades – Préfets and their adjuncts have been appointed by the president, and chefs de village have assumed their roles through a variety of means, such as informal elections — often involving only men — and heredity. These elections would lay a foundation for more substantive national elections, and might also help establish trust in communities riven by looting and brutality. Also immediately valuable: more money. The levels of violence got as bad as they did in part due to the weak economy and the piling-up of arrears in civil servant salaries, especially over the second half of 2013. Market purchases and bar sociality cultivate a day-to-day “˜getting along’ no less real for being bred of practical necessity, and the drying up of money removed any such possibilities for social lubrication. An injection of cash, such as by paying those salaries, would do much more for people’s well-being and the establishment of security than a strictly “˜humanitarian’ distribution. The CAR, an improbable country on a variety of levels, has never had a tightly-woven social fabric. It’s always been more of a loose netting that has become dangerously frayed over the last few years. But it can be mended, and these small-scale processes, plus technocratic governance from President Samba-Panza, are good ways to start. Louisa Lombard is a Ciriacy-Wantrup Postdoctoral Fellow in Natural Resource Economics in the department of Geography at the University of California at Berkeley. Great piece. CAR is a lesson on the realities of state building. It is about time the international community re-calibrated its expectations with regard to the possibilities of democratic (read electoral) state-building. It just doesn’t happen. The type of elite consensus required for democratic stability cannot be nurtured in the context of elections.